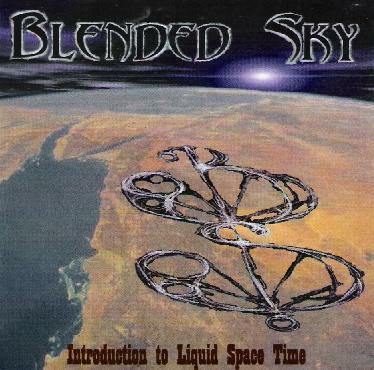 Blended Sky - "Introduction to Liquid Space Time"
Brutal stoner rock from France reminiscent at times of Blue Cheer and early Monster Magnet circa Spine of God. Huge fuzz-drenched guitar and a super-sludgy rhythm section power this five-song EP, while Jack Grants' acid-injected vocals gruesomely relate apocalyptic visions of personal addictions and private hells. As with most other stoner metal and its ilk, there's not much variation in song structure: a massive wall of sound that more resembles a relentless blitzkrieg rolling through a thunderstorm of hail and fire. Lots of primal energy, to be sure, and an aesthetic of pure malevolence, particularly on pieces like "The Marvel Secret" and "Allenski." Perhaps intentionally, each song on Introduction to Liquid Space Time sounds as if it were recorded at a nuclear reactor during a core meltdown, which undeniably creates an atmosphere of urgency and desperation as the group plows its way through the radioactive haze guitarist Chandler J conjures up from his hundred watt stack and assorted fuzz pedals. Death-dealing, bone-shaking, ear-splitting sonic destruction for metalheads, stoner chicks and other assorted psychos. For more information you can visit the Blended Sky web site at: http://www.blendedsky.net. Hear Blended Sky at their Myspace site at: http://www.myspace.com/blendedsky.